Yesterday it snowed, and the temperatures dipped to a chilly 32 during the day. 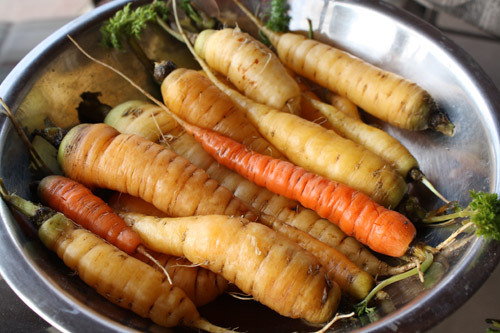 It seemed the perfect time to turn my tenacious carrots into a belly-warming dinner. I happened to also have a head of not-so-fresh cauliflower on hand, so I supplemented my carrot crop with some of that, but you could easily make this recipe with 4 cups of carrots (or 4 cups of cauliflower). Although I think 2 teaspoons of curry powder is just about right for this amount of soup, you will probably want to add 1 teaspoon and taste it before dumping the whole amount in–we tend to eat spicy! Add the garlic and ginger to the bowl of your food processor and pulse several times to mince (or do it with your knife). Set aside. In a small bowl, combine 2 tablespoons of the stock with the flour. Set aside. Heat olive oil and butter in a large wide-bottomed pot over medium heat. Add onions and sauté, stirring occasionally, until translucent, about 5 minutes. Add ginger and garlic and cook for a minute or two more. 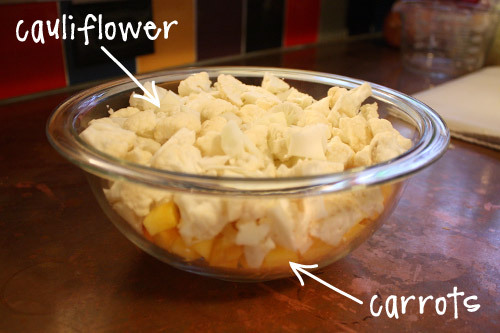 Add carrots and cauliflower, and sauté 6-7 minutes more. Carfeully puree mixture in a food processor or blender, in batches. Return to pot. Bring heat back to medium high. Whisk together the remaining stock and flour, and whisk into the soup. Add milk, and bring to a boil. Reduce heat to medium low and cook until slightly thickened, about 5 minutes. Thin with more stock, milk, or water, if desired. 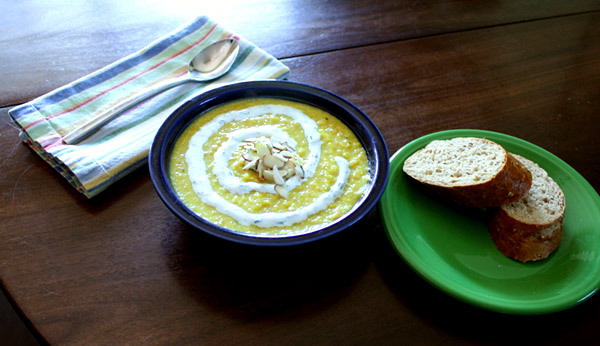 Curried Carrot and Cauliflower Soup ~ Delish! Wonderful – nothing quite like a cantankerous carrot. They’re one of my favourite soup ingredients.